Photographs were released showing the python being handled by dozens of the construction workers who found it and a video shows one man kicking the snake. 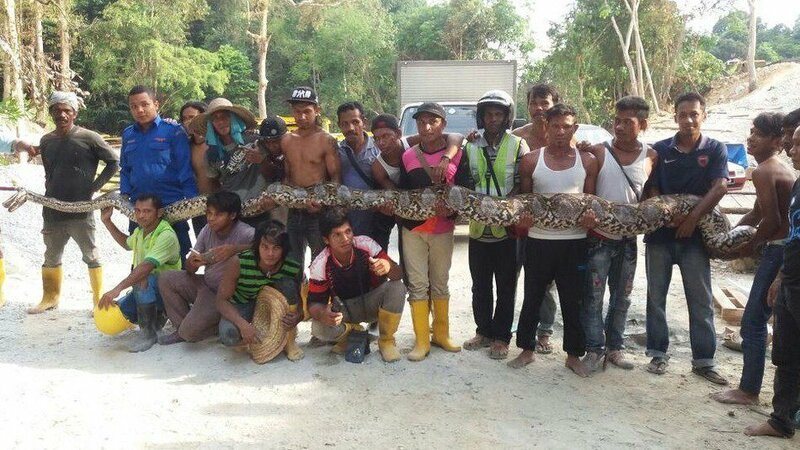 A reticulated python captured last Thursday in Malaysia, thought to be the longest snake in captivity, died a short time after being caught, and the Malaysian Nature Society (MNS) is questioning whether mishandling caused the giant creature to die. The snake is estimated to have been 26 feet long (8 meters), weighing over 550 pounds (250kg). The snake died on Sunday after laying a single egg. Questions are now arising as to the handling of the python, which was discovered by construction workers. Photographs were released showing the snake being handled by dozens of workers, with its mouth taped shut. A video shows one man kicking the python. Other photos show a noose around the snake’s neck. A civil defense official said that the snake was most likely stressed due to the handling and attention it received, and that the stress probably contributed to the python’s death. Raymond Hoser is an expert on snake handling who gave reticulated pythons the scientific name of Broghammerus Reticulatus. He said that the most likely reason for the snake’s death is injuries that it received during or after being caught. He says snakes are delicate animals, and that a snake in a noose will struggle, leading to broken bones and internal bleeding. According to the Guardian, workers from the construction site called emergency services when the snake was found, and it took 30 minutes to trap it. MSN advisor D. Kanda Kumar said that the snake should have been immediately turned over to the Wildlife and National Parks Department, which has appropriate staff and facilities. It will be impossible to investigate the death of the giant python since the body was incinerated. However, the Penang government has requested that the Wildlife and National Parks Department produce a report on the matter. Another reticulated python known as Medusa is the longest snake ever kept in captivity, according to the Guiness Book of World Records. She lives in Missouri, and measure 2.67 meters and weighs 158.8 kg. Reticulated pythons are usually about 3 to 6 meters in length. Their name comes from the gridded pattern on their skin, and they can normally be found in water.